Conveniently located and within a few minutes’ walk of the centre of the village, this lovely detached holiday house is an ideal base from which to explore and savour the delights of the Cotswolds, much of which is designated as an Area of Outstanding Natural Beauty. With the sparkling and swiftly flowing River Windrush racing through the broad expanse of village green, the ’Venice of the Cotswolds’ as Bourton is referred to, is a treat for visitors no matter what time of year. With its graceful low stone bridges spanning the small river at intervals, the centre of the village is picture postcard perfect throughout the seasons. The Roman road, the Fosse Way, is a major access route running across the area, taking the visitor from Moreton-in-Marsh in the north to Cirencester in the south. Local Bourton attractions include the Model Village, Motor Museum and Birdland. Blenheim Palace, Oxford, Stratford-upon-Avon, Warwick and Kenilworth castles are all within a comfortable drive, while the beautiful gardens of Kiftsgate Court and Hidcote Manor are near beautiful Chipping Campden. Shop, pubs and restaurant 800 yards. Ground floor: Living/dining room with French doors. Kitchen with slate floor. Utility room. 1 double bedroom (5ft) with en-suite bathroom with bath, shower cubicle, bidet and toilet. Separate toilet. First floor: 3 bedrooms: 1 double (5ft) with en-suite shower room and toilet, 1 double (6ft) with additional single and en-suite bathroom with toilet, 1 double (6ft, zip and link) with additional pull-out single and en-suite shower room with toilet. Open fire in living room (initial fuel included). Gas central heating and gas included (extra charge November - March). Electric, bed linen and towels included. Travel cot. High-chair. Satellite TV. DVD. CD. Gas Range. Microwave. Washing machine. Tumble dryer. Dish washer. Freezer. Wi-Fi. Large enclosed lawned garden. Patios, sitting-out area and furniture. Barbeque. Ample parking. No smoking. Holidays run from Friday to Friday. For a better idea of where Alderley House is, you can see Alderley House on the map below. 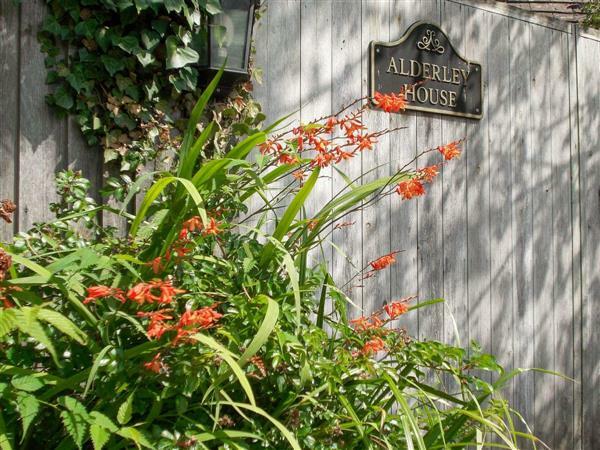 Alderley House is in Gloucestershire; should you be on the lookout for a special offer, you can find all the special offers in Gloucestershire. It's always worth checking to see what is on offer at the moment. Do you want to holiday near Alderley House (25315), you can see other cottages within 25 miles of Alderley House; have a look to find your perfect holiday location.